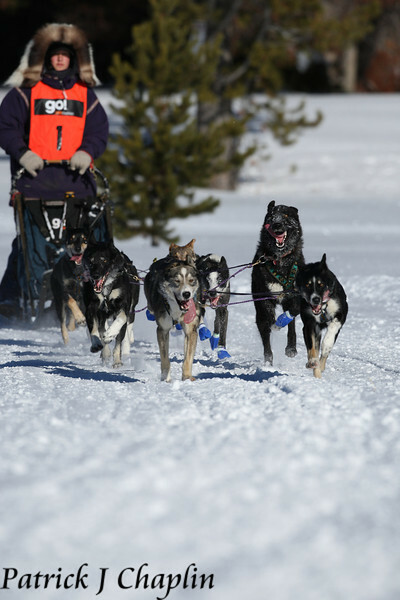 Trail Tales and Tails: Load Up the Family and the Dogs, We're Going to the Darby Dog Derby! Load Up the Family and the Dogs, We're Going to the Darby Dog Derby! 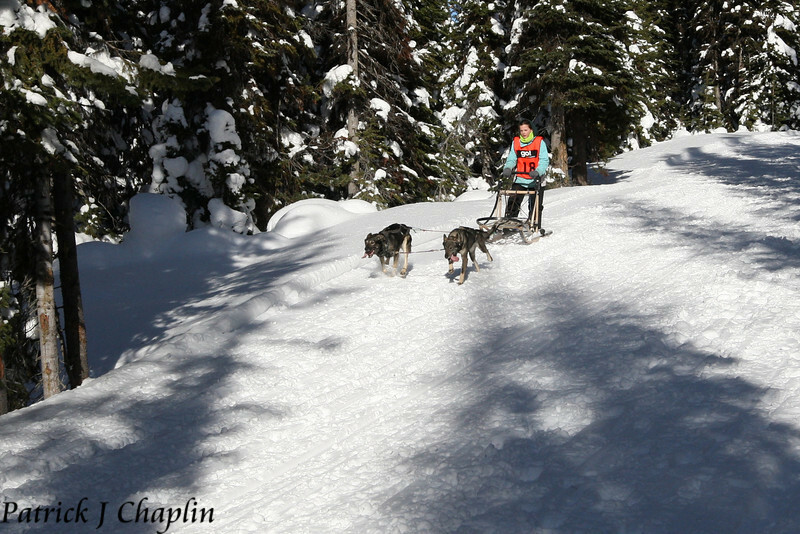 I always enjoy coming to the Darby Dog Derby, a local Montana race that takes place south of Missoula, but this year was especially enjoyable because Sydney, Jaden, Erika, and Shelby competed in the race, their first sled dog race. 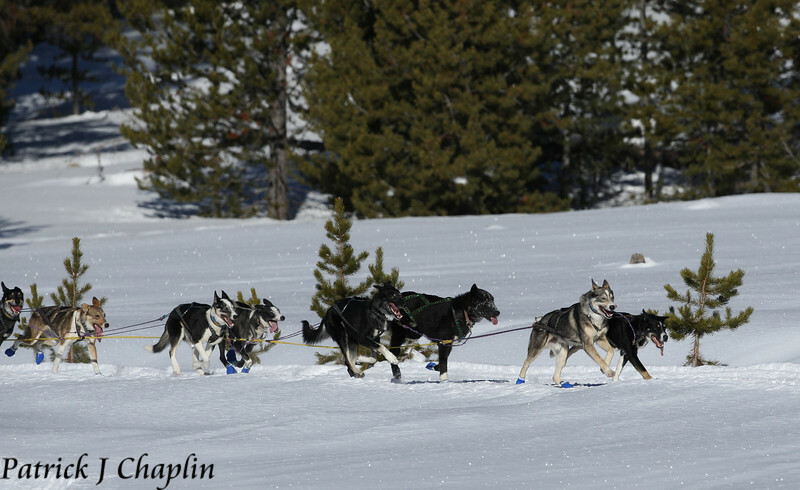 The three older girls entered in the 2-dog junior race, and Shelby entered in the peewee 1-dog 100 yard dash race. I also was entered in the 8-dog event, but the highlight of the weekend was watching the girls race. The older girls' race was 2 miles long each day, so a total of 4 miles over the two days. They each ran two dogs on their teams. Sydney had McGee and Otter, Jaden had Super Cub and Cessena, and Erika had Khufu and Piper. 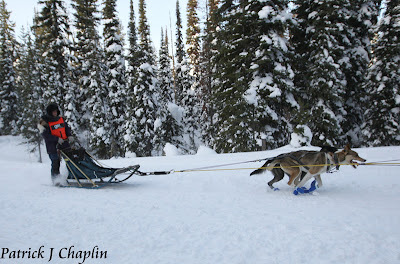 I tried to split the teams up as even;y as I could and gave the heavier sleds to the faster dogs to even it out more. It was up to the girls and I really had no idea who would be crossing the finish line first. The first day all the girls did great and had a good time despite some tangles and confusion at the turn around. It was incredibly nerve-racking for me to send the girls out on the trail and not be able to help them (now I know how my Dad feels...) but they handled the situation like pros and were able to sort out things themselves and get headed back down the trail. After this first day, Sydney was in the lead followed by Erika and then Jaden. There was about 3 minutes between each of their times, and it would be interesting to see how much time each of them could make up the next day. 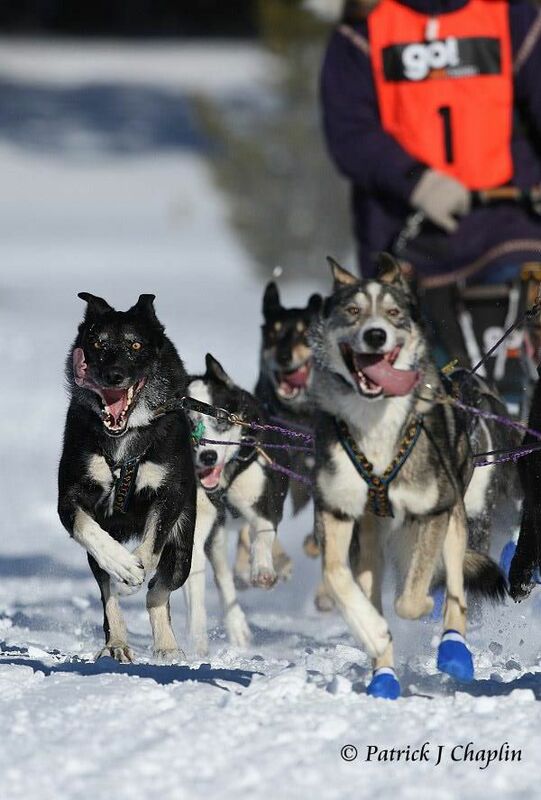 With my race, I took it really slow and just let the dogs have a good relaxing run. With IPSSSDR just around the corner, I didn't want to injure any dogs in this race. The dogs did great, except they didn't want to cooperate with my slow and relaxing plan, so I got a thorough work out from riding the brake most of the way. Bella and Emmett led for me, followed by: Alice, Jasper, Ra, DiNozzo, Embry, and Kaycee. After the second day we were sitting in 2nd place with a huge gap between us and the first place team. 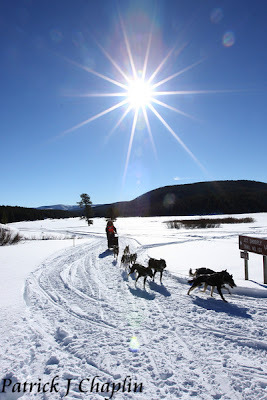 I was happy though, I had no hurt doggies and Sydney, Erika, and Jaden had all had good runs. 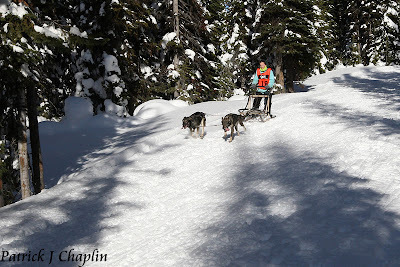 Before we headed back into town, Erika and I took the dogs that didn't race and the dogs that did the junior race for a training run on the 8-dog course. With 11 dogs, we double sledded it and had a mostly good time. I decided to run the race trail backwards, avoiding a section that was a little punchy, but I forgot about the switch backs that my change in course had us going down instead of up. 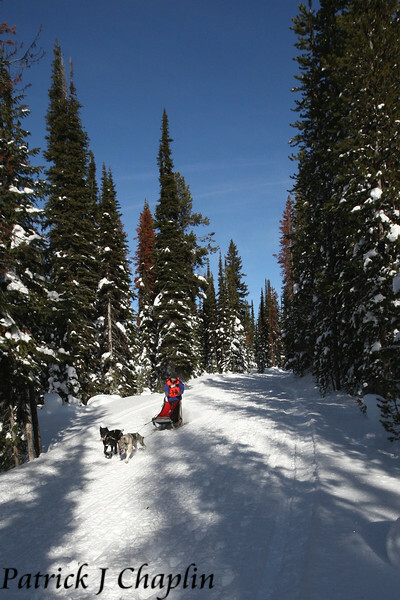 The first switch back sent poor Erika flying as her sled went into a roll. I was able to stop the team, but it was hard to hold them back on the down hill even with both hooks set. Like a champ, Erika got right back up and hopped back on the sled. The next two switch backs were better, even though they were tighter. I told Erika that I would do the braking and she just needed to concentrate on steering the sled around the corner, this helped since the first time she was thinking too much about using the brake and lost focus and her balance and steering. The run was good though, and after we got back and took care of dogs, we were ready for some food and a pillow. I want to thank our friends, Cathy and Jeff Lowe, who let us all stay at their place for the weekend. In previous years, we have camped at the trail head, but it would have been difficult with eight people. Plus, it is always nice to have a warm dry place to get ready for the next day of racing. On the second day, the trails had set up well, so I was going to let my team go a little bit faster. We were actually ten minutes faster than our time the first day and clocked in the fastest time of the day. It was not enough time to move into first place, but we held onto our second place and had no injuries or tired doggies! The girls had a better day of racing too, and didn't have any tangles at the turnaround. They all held onto their placings from the first day, and Sydney actually doubled her lead. I can't be more proud of them, they all did great and were great sports. I was able to get video of their finishes on the second day too! 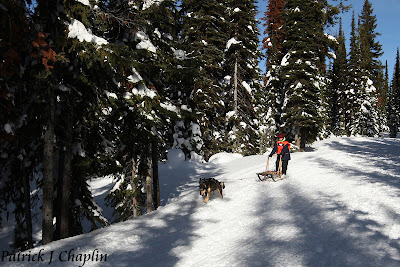 Shelby's race went really well too, she ran McGee 100 yards down the trail and back and had a great time. She did great and ended up placing 5th out of a big group of 15. She was a little bummed her and McGee didn't win, but was excited that she had gotten to run her favorite dog, even though I told her that she would maybe have to run someone else if McGee was too tired after racing with Sydney. Patrick Chaplin took great photos of the weekend, and you can see them HERE.